Four incidents have been reported this year in maritime waters of the Gulf of Fonseca between naval forces of Honduras, El Salvador and Nicaragua. Foreign Minister Arturo Corrales said that according to information disseminated in the media, there have been incidents, “that don’t get labeled as a conflict because there is none, although there have been incidents requiring Governments to understand the process of the Golfo de Fonseca” and to comply with the judgment of the International Court of Justice in the Hague. Information not confirmed by the Ministry of Foreign Affairs revealed that Honduran military boats were intercepted in the Gulf by speedboats belonging to El Salvador and Nicaragua, which denied safe passage out into the Pacific Ocean. In addition, a Honduran coast guard unit displaced a small Nicaraguan boat that tried to prevent the navigation of the vessel. None of the countries has officially confirmed the incident. According to confidential sources, the first incident occurred in March of this year and the last, two weeks ago, when a fleet of six boats of the Honduras Navy, composed by a coast guard and six speedboats code named “piranhas”, went out to patrol national waters and headed for the exit to the Pacific Ocean and was intercepted by six Nicaraguan Navy speedboats. A Piranha crossed the path of the Honduran coast and ended up destroyed, but there were no deaths of occupants of the damaged ship, said the source. Honduras ordered the air force fighter jets to patrol the Gulf of Fonseca to ensure the security of the Naval fleet. The Naval fleet of El Salvador was not part of this because it came out too late. Nicaragua and Honduras did not file official complaints nor did they report the incident to the United Nations Security Council. President Porfirio Lobo admitted that there is “friction and conflict” in the Gulf and demanded Nicaragua and El Salvador begin work on the establishment of a zone of growth and development. The ruling issued by the Court in the Hague for the past 20 years said that the three countries are entitled to three nautical miles of sovereignty after the line of beach of its territories in the area. Furthermore specifies that the three States will have right to exit to the Pacific Ocean, but that the delimitation of the mouth shall be defined in a tripartite negotiation. Corrales added that the Government was open to negotiate the handling of the mouth area, but without “losing an inch of territory that belongs to Honduras”. The approach recommended by Honduras is to define a shared management mechanism, mainly with regard to the mouth. The Secretary of Foreign Affairs communicated to El Salvador and Nicaragua last week its proposal on the distribution of territories, in which emphasis is that Honduras have safe passage to the Pacific Ocean, according to the ruling from the Hague. 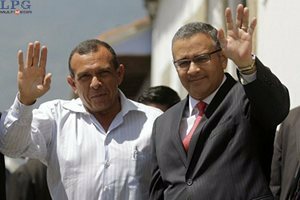 Tomorrow Tuesday December 3rd, 2012 at 4: 00 pm a meeting will be convened for a tripartite meeting in Nicaragua with the presence of the Presidents of Honduras, Porfirio Lobo; of El Salvador, Mauricio Funes, and the host country, Daniel Ortega. The agenda of the meeting is to establish safe passage to the Pacific and the co-sovereignty at the mouth of the Gulf of Fonseca. The Honduran authorities presented a few weeks ago to the UN Security Council a request to enforce the ruling of the Court, given that there is no willingness by El Salvador. Several meetings on the issue have been postponed by Funes. Were El Salvador and Nicaragua to persist in its refusal to establish the delimitation of the mouth, Honduras reserves the right to invoke the intervention of the Security Council, said the Chancellor. The previous week, Honduras first proposed a negotiating document to carry out the demarcation and this was sent to the Salvadoran and Nicaraguan authorities. Honduras proposed that, as a starting point, in the closing line of the Gulf mouth, “each State shall have an area of exclusive sovereignty of three nautical miles in length: Nicaragua, measurements from Punta Cosigüina;” El Salvador, measurements from Punta Amapala; and Honduras, steps from the center of the line’s closure, a mile and a half towards Punta Cosigüina , and the other by a mile and a half, measured towards Punta Amapala. Of important note is that the El Salvador Newspaper “La Prensa Gráfica de El Salvador” published Tuesday the 27th of November that the discussion on maritime boundaries in the Gulf of Fonseca, whose outlet to the Pacific Ocean is under the sovereignty of El Salvador and Nicaragua, is not within the agenda of the meeting by President Mauricio Funes with his peers of the countries of Nicaragua, Daniel Ortega, and of Honduras, Porfirio Lobo; and stated that the meeting was cancelled. The Secretary of communication of the Presidency, David Rivas, yesterday confirmed to the Salvadoran media that in the meeting’s agenda there is only a project management and comprehensive development of the Gulf of Fonseca discussion, which is looking to establish benefits for the three countries and explained that there are no plans to discuss the maritime border areas which are proposed in order to grant Honduras an outlet to the Pacific Ocean. Rivas denied that El Salvador will go to Managua to negotiate maritime boundaries with Honduras, and expressed “the objection of the Salvadoran Government on the Honduran proposal,” since it recognizes that the neighboring country is in an election period and the issue of limits on the Gulf takes dyes of proselytizing a campaign. The Honduran Foreign Minister Arturo Corrales confirmed that the meeting on Tuesday is to address the issue of the Gulf of Fonseca and the enforcement of the judgment of the International Court of Justice, “with or without the presence of El Salvador”.